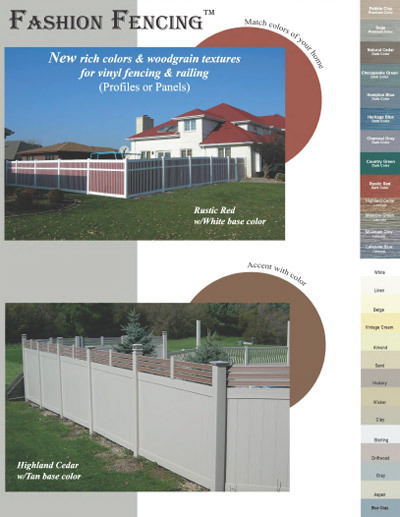 The advancement of Fashion Fencing has greatly expanded the variety of color and texture choices available for vinyl fencing by combining vinyl sheet goods with vinyl picket profiles. The sheet goods are made from the same durable, low-maintenance vinyl material found in vinyl siding products that have been highly proven and widely accepted in the marketplace for years. 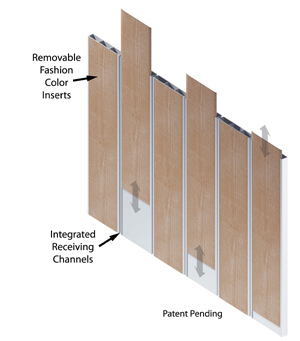 Flat modular inserts are cut and shaped from the vinyl sheet goods and then secured to the face of each picket by simply sliding the insert through integrated molded receiving channels. The inserts are interchangeable and offer you the ability to mix and match colors to ultimately create and customize your own designs. 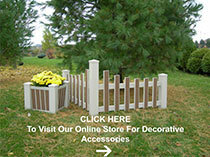 There are over 25 varieties of vinyl colors to choose from when designing your project. You are no longer limited to the standard industry colors of white and tan. With Fashion Fencing, you can more easily coordinate fence and railing with the colors of shutters, siding, soffits, roofing, windows, doors, landscape, etc. As for commercial applications, businesses now have a new tool available to further strengthen their brand identity by incorporating company colors into fencing and railing designs. This is a powerful option when considering the signage restrictions many municipalities now enforce.